This section is a collection of technology news subjects and designs that not only have they made main stream news channels but are also in my view items of particular importance that will shape our future. Yes believe it or not Phillips has invented an internet enabled LED light bulb. Designed to plug into existing lamp holders the Wi-fi enabled bulb can be controlled via your smartphone or tablet computer. Why? Well it has serious applications such as acting as a security light that can be remotely switched to simulate your home is occupied when you’re on holiday but more importantly the bulb is capable of operating in just about every colour imaginable and at varying brightness levels too. Not quite a disco light but it can be used to set the colour temperature of a room. It is Plug and Play, no network cables, no additional wiring, no dimmer switches just plug it directly into any standard centre room light fitting or a portable lamp. You do need a bridge that plugs into your Wi-Fi router and each bridge can control up to 50 lights. 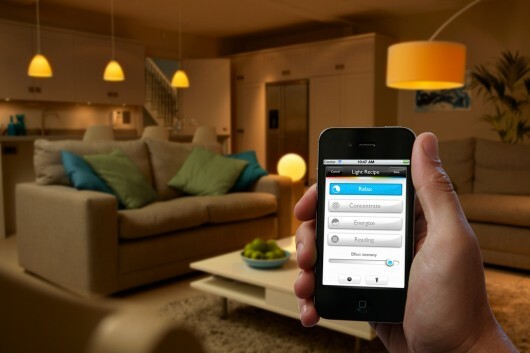 The app available for both iPhone and Android phones and tablets allows individual control of the bulbs. You can use the simple interface to control the colour and brightness using sliders and save the settings as “light scenes” that you can recall later, you can even set the colour from a photo or image displayed on your screen. The app also includes pre-programmed “Light Recipes” based on Philips research into the biological effects of lighting that are designed specifically for relaxation, reading, concentrating and energizing. People are asking why and does it really have a market treating it more as a gimmick or toy. God those people have no imagination or creativity! It is a toy, a luxury for our homes to make your neighbours shout “cool”. I want one! Not to impress but because I like moods! What I am confused about is if we now have this kind of connectivity with a simple light bulb then why do we need to “Dock” anything or attach audio leads to play music from portable devices such as a mobile phone or tablet PC’s? We have seen Wi-Fi enabled clothing, toasters, and now light bulbs, what’s next? Thought your new 50 inch HD TV was the latest technology? Well Super Hi Definition TV is now here. It is 16 times as sharp as HD TV. Resolution is 8000px x 4000px or 32,000,000 or a cool 32 Million pixels. Super high definition TV needs a bandwidth of 350MB/s to transmit a live feed so our 50Mb super fast broadband has some catching up to do before we will be able to actually watch it. Skinput is a technology developed by Chris Harrison Ph.D. Skinput allows devices to be controlled by using your skin as the input device. Simply by touching or tapping a particular part of your skin or fingertips you can send commands or instructions to a device that you wish to control. The system consists of an armband that has sensors that picks up the tiny vibrations made when you touch or tap your skin. Described as a Bioacoustics sensing array the armband is able to distinguish very accurately between different touch points on the skin. Going a step further an image can be displayed on the skin with a Pico projector. The image projected on the skin then becomes the control display or control buttons which are touched to control the device in exactly the same way you would touch the screen of your iPhone. Its creators state that a major advantage of this device is that you do not need to attach the input device or buttons to the skin however the actual biosensor still needs to be worn and is rather large. The sensor also needs to be connected to a computer which decodes the vibration signals to commands. It is however a very cool and innovative device and I am sure that the biosensor will become smaller and more discreet and possibly take on a completely different form and may not need to be worn at. It could even be integrated into the device to be controlled which could simply be placed in your trouser pocket.